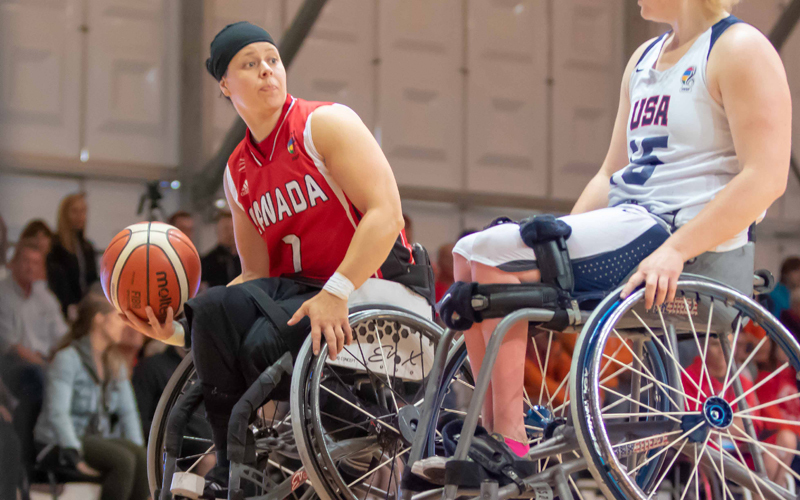 (Hamburg, Germany) The Canadian Women’s Wheelchair Basketball Team locked up fifth place at the 2018 World Championships courtesy of a decisive 68-53 victory over rival the United States on Saturday in Hamburg. “I think we are building for the future,” said Canadian Cindy Ouellet (Quebec, Que.). “We have a young team and a young group here. We have only been working together for a few years, so it’s really promising for Tokyo. Winning today, we have something to build on. We are going to be ready and come out strong. Ouellet tallied a game-high 20 points in just over 26 minutes of work. Kady Dandeneau (Pender Island, B.C.) had 16 points, followed closely by Arinn Young (Legal, Alta.) with 14 points. Tamara Steeves (Mississauga, Ont.) added eight points for Canada. The Canadians put on immense defensive pressure early and often, capitalizing on a staggering amount of turnovers by the Americans. Canada built up a 37-22 lead at halftime, including a three-point dagger from Young to close out the half. With a significant lead in hand, Canada utilized its depth down the stretch with the full roster getting into the game. Overall, the Canadians were rewarded for solid defensive play and a killer instinct in transition, as Canada converted 22 points off of American turnovers. 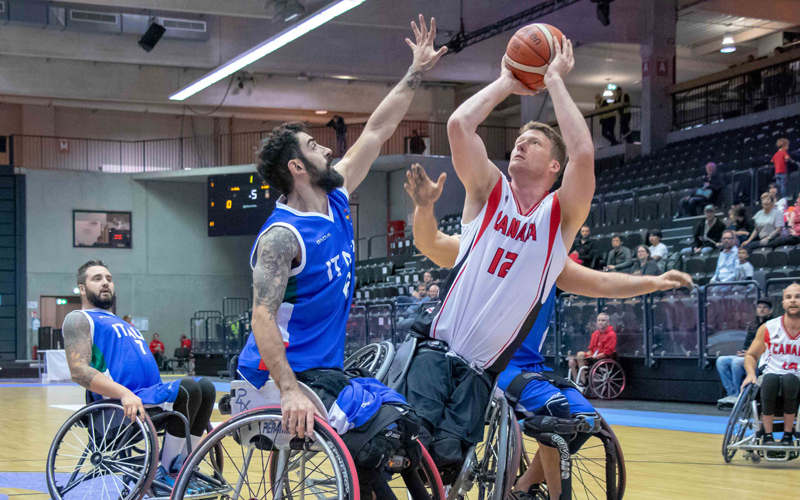 The Canadian Men’s Wheelchair Basketball Team placed 12th at the 2018 World Championships after falling just shy of a comeback in a 70-66 loss to Italy. “Twelfth is not what we came here to do, so it’s very disappointing,” said Canada’s Patrick Anderson (Fergus, Ont.). “It’s going to take a little bit of time to get past it. I hoped that even if we didn’t win a medal here that we would be close enough that we could see a few things that we could work on to be better to close the gap between us and the best teams. Nik Goncin (Regina, Sask.) dropped a game best 30 points for Canada, while Anderson picked up his fifth double-double in five games on the strength of 22 points and 11 rebounds. The Canadian men missed the mark against Italy in a rough but otherwise even match, shooting just 38 per cent from the field compared to 47 per cent by the Italians. The Canadian offence struggled to find its rhythm through three quarters, while Italy shot well from the outside en route to a 56-46 advantage going into the fourth quarter. Canada showed character by coming out firing in the final frame, erasing the deficit to tie the game 66-66 with 38 seconds left. Italy hit a clutch layup to go up by two and closed out the game from the free throw line to hold on for the win.